With a flick of his wrist, Hannes Sjoblad throws me his business card. There is no white rectangle of card for me to catch though. Instead, my iPhone lights up. He has just wirelessly transmitted his phone numbers, e-mail address and Twitter handle from a small microchip implanted in his wrist. Mr Sjoblad is the chief disruption officer of BioNyfiken, a Swedish “bio-hacking” group. Members of BioNyfiken are trying to hook themselves up to the internet. They all have radio-frequency identification chips implanted into the backs of their hands. The chips, no bigger than a grain of rice, store personalised information that can be transmitted over short distances to special receivers. As well as pinging digital business cards to nearby smartphones, members of BioNyfiken are using their chips to open electronic locks on their front doors and go shopping in Stockholm. They are lobbying for the chips to be accepted on public transport. Soon the chips could be used as personal identification tags, perhaps to identify who is driving a car. A swipe of the wrist across a steering wheel chip reader would tell the car who was sitting in the driver’s seat, and adjust the controls and radio station as appropriate. Members of BioNyfiken want to become part of the internet of things (IoT). This is a concept whereby “smart” devices – essentially objects containing microchips that connect them to the internet – will become ubiquitous. But humans with chips in their wrists, pets with chipped collars, as well as connected electrical appliances, such as toasters, fridges and washing machines, home thermostats, cars, can also hook up. Billions, perhaps trillions of things – and people – would be able to communicate with each other. One of the advantages, advocates say, is that we will be able to automate the mundane aspects of our lives. The same goes for industry. The central promise of an industrial internet of things (IIoT) is that machinery can be made to run more efficiently, increasing productivity. Such machinery contains interlinked environmental sensors that provide real-time feedback about a wide variety of conditions to a central source that may be thousands of miles away at corporate headquarters. Intelligent software algorithms process the data to tweak the conditions and improve efficiency. The software predicts equipment failures long before they happen. In 2012, companies across the world spent approximately $20 billion on technologies linked to the IIoT. By 2020, this spending is expected to exceed $500 billion. 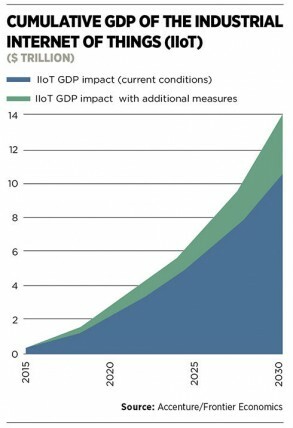 Such is its promise that by 2020 some believe the IIoT could contribute more than $14 trillion to the world economy. Several pioneering companies are already embracing this new connected world, although there are many more that have not, perhaps hampered by a lack of understanding about the benefits of the IIoT or held back by an outdated regulatory environment. There is also genuine concern about connecting more of our critical infrastructure and industry to the internet, potentially allowing cyber criminals to steal corporate secrets and extort ransoms, or hostile foreign governments to attack core systems. These concerns are real – it was only five years ago that security researchers discovered Stuxnet, a virus that infected and ultimately helped to destroy uranium centrifuges at an Iranian nuclear facility. However, there are more good reasons than bad to pick up the IIoT baton. There is also an important defensive play to make. As the digital world creates opportunities for incumbent industry, it also opens the door for new competitors. Google, for example, is a company built up from an internet search engine. Yet now it is testing the most advanced driverless cars in the world, raising high-altitude balloons that beam internet connections to far corners of the globe and conducting a large-scale medical study which aims to predict the onset of terminal diseases. Companies that embrace the IIoT can channel this sort of entrepreneurial spirit. Say that software engineers at a steel mill create some software that improves the efficiency of the mill by 10 per cent. Why not sell that software to other steel companies, not just in the UK, but across the world? And why not see whether the concepts behind the software can be applied to other industries and develop it accordingly? The IIoT is set to have more than just money-saving applications, opening up new revenue streams for the companies that are prepared to innovate. The IIoT also reaches into the workforce. If employees are able to receive detailed feedback from customers about how they use the things they sell, they can tweak product design accordingly, based on a wealth of incisive information. It is a technique used widely by big internet and software companies, which receive trillions of gigabytes of automated feedback, transmitted over the internet, from computers and smartphones running their programmes. The IoT, industrial or otherwise, is no longer a faraway concept. 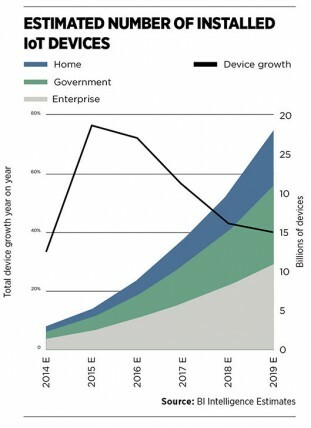 A recent estimate by Gartner suggested that 3.9 billion smart devices were connected to the internet by the end of 2014. This figure will, the technology analyst believes, rise to 25 billion by 2020. 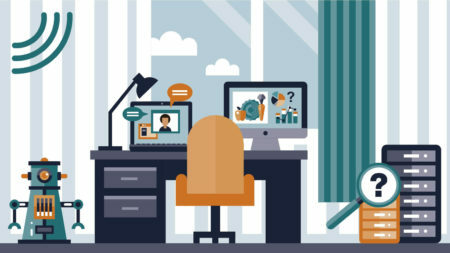 Separately, Cisco estimates that 99.5 per cent of the 1.5 trillion connectable devices in the world are currently offline. Meanwhile, the world’s biggest microchip makers are merging with and acquiring each other to better position themselves for a world where cheap, simple chips are inserted into pretty much anything that rolls off a production line. In May, Singaporean chipmaker Avago, which was once the electronic components division of Hewlett-Packard, announced it intended to buy Broadcom, in the United States, for $37 billion (£23.3 billion). It is one of the biggest takeovers the technology industry has ever seen and the latest in a string of big deals in the semiconductor industry. The power of smart industrial systems will only increase as the artificial intelligence (AI) that runs them becomes cleverer. Machine learning – the process by which software “learns” from past experiences to enable it to predict the future – is becoming increasingly formidable. The longer that industrial AI is exposed to real world conditions, the smarter it gets. As such, getting connected sooner rather than later would appear to be a sensible ambition.